I recently had a conversation with a couple of fellow deer hunters. One is fairly new to deer hunting the other is a long time hunter. Both of them hunt exclusively over bait. The conversation turned to the subject of the DNR announcement that all baiting will be banned starting in 2019 to hopefully help in controlling the spread of CWD. There was comment on what this would do to the deer population, one comment was that the deer population would grow out of hand because of the lack of not only bait pile hunting but there is likely to be a large number of people who just wouldn’t hunt deer anymore. What are the alternatives to no longer baiting? In a word, hunt. Baiting deer was unheard of when I started hunting northern Michigan back in the mid 70’s. I have no records of what the deer population was back then but I seem to remember hearing that there were far fewer deer back then than there are now. Sure, it depends a lot on location some areas just naturally produce and maintain more deer than others. I also seem to remember hearing somewhere that each year the number of licenses sold was around one million each year. My point here is that we had for the most part quite a bit fewer deer than we do now and that a whole lot of people were out there ever year hunting for them. What the success rate was I cannot say, I am sure there are some old records or estimates out there somewhere. Those of us who hunted the many acres of public land were considered stump sitters and that’s what we did for the most part. If you got cold or bored you moved. We will be forced to once again find the deer instead of having them come to us. We will have to find out what the deer or feeding on and the routes they use to get from their bedding areas to there feeding areas. Are there acorns on the trees this year? Maybe beech nuts? Perhaps there was a logged off piece of woods where you hunt, the deer will be attracted to that for a couple of years feeding on the new growth and later using it for the heavy cover that usually overtakes it after a while. Deer are creatures of habit and they are browsers. They will follow certain trails regularly and browsing means they stay on the move for the most part. Sometimes you see deer in an area for quite a while, other times they give you only a quick glimpse before they are gone again. We are going to have to be careful about where we place our stands to keep the wind in our favor and stay away from certain spots if the wind is wrong (should be doing most of this now) there will be some other things that we will have to learn or relearn maybe. I seem to remember as a young hunter that sightings of a buck were usually very brief and you wanted to stay alert and ready to take a quick shot if needed. I would like to say that I maintain that alert attitude when I hunt because I have not hunted over bait in quite a few years. The difference is (although not always) that a deer coming in to a bait pile has the intention to eat and depending on what you are using for bait they may stay for a while giving you time to make a careful shot, hopefully. I would hope that those of us who enjoy deer hunting will not let the ban on baiting stop us from going into the woods. I can’t help but think of the old black and white photo’s I’ve seen from way back when of men dressed in wool coats posing next to a big buck or a pole sagging from the weight of the deer on it. 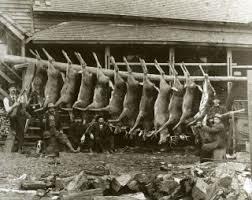 How did those guys get their deer, especially back in the day when the population was certainly lower than it is today. They knew how to hunt, where to find the deer and before the days of range finding scopes, they learned how to shoot, with open sights no less. I can only imagine what a week or more in an old deer camp would be like back in those days. They didn’t have hand warmer packets or high tech long underwear and down filled coats with Gortex liners. 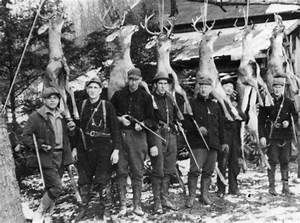 They hunted and shot deer year after year. I am talking about gun hunters for the most part, the challenges to a bow hunter even with a modern crossbow will be increased also. My first bow killed deer was taken with a compound while trail sitting, come to think of it so was my last. Just a quick observation. Out of all the old hunting pics I have seen most show deer strapped onto cars but almost none show anyone with a pickup truck. I’m not giving up my pickup.